Final one of the week and what a tune to park on our homepage until Monday! Featured on the site earlier in the week, this is easily one of the tunes of the year and one we just can’t stop playing, largely thanks to the stunning vocals of Skunk Anansie’s Skin. We’ve loved Skin’s voice for years, the power of it on tracks such as ‘Brazen’, ‘Hedonism’ and the massive ‘Weak’ set her apart from many of her contemporaries. That, and the fact that she just looked boss over them too! Dance music seems to be her new home now as the community embraces here unique voice. 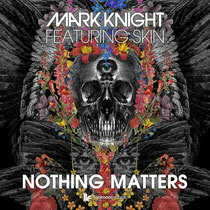 Earlier success with Erick Morillo and Eddie Thoenick on ‘If This Ain’t Love’ now leads her to this moment, her collaboration with Mark Knight – DJ, producer and head of Toolroom Records. With alternative remixes supplied by CaPa, Tensnake and Noisa, it’s the original track that does it for us. Mark producers an uptempo, bass heavy bassline that’s reminiscent of early Bedrock with its slight acidy feel. When we mentioned earlier that it’s on repeat largely due to Skin’s vocals, it would be wrong to underestimate Mark’s production input here, it makes the track. The beats are wicked, the drops into Skin’s ‘vocal only’ parts are clever, perfectly timed, raise the hair on the back of your neck and when Mark introduces the beats again, you can’t help but be swept away by its musical journey. Absolutely tremendous, check it out below, it’s out on Monday.